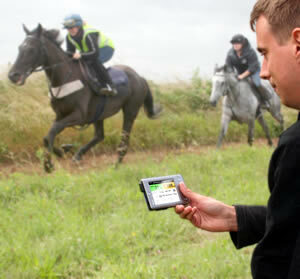 New GPS technology may help racehorse trainers get the edge on their competition. A British company has developed a GPS product that attaches to a horse to send essential physical, physiological and environmental information about a training workout to the trainer, via the internet. Having immediate access to information detailing the work the horse is doing, its gait, temperature, breathing and the environmental conditions means that trainers and vets will be able to optimise training regimes while at the same time ensuring its welfare, says developer Gmax Ltd. The company is a spin-off from technology and product development consultancy Cambridge Design Partnership (CDP). The monitoring electronics to achieve this are built in to a sleeve that slides over the girth. Real time information is transmitted wirelessly to a trainer's mobile, PDA or laptop anywhere in the world. Information to help control the workout can also be sent to the jockey via a specially designed wristwatch. "Often the difference between first and second in a race is fractions of a second, just as it is in human athletics," said CDP director Mike Cane, who has led the development of Gmax. "Gmax has an important role to play in bringing the principles of sports medicine to thoroughbred racing to maximise a horse's chances of winning. "Current training methods rely heavily on visual assessments coupled with years of experience. While Gmax will never replace good horsemanship, it will provide trainers with objective measurements of training workload and response; replacing guesswork with scientific evidence and making elite training methods accessible to all."